A new edition of The Hound of the Baskervilles suggests Sherlock Holmes's best-loved case may actually have been more of a journey into the psyche of its author rather than a simple whodunit, reports Yorkshire Today. Dr Francis O'Gorman from the University of Leeds has just completed a fully annotated version of the Hound, a book first published 105 years ago and loved by millions across the world. Dr O'Gorman believes Hound, often overlooked by those who dismiss it as nothing more than a quick read, highlights not only Conan Doyle's own developing spiritualism – as a friend of Houdini, he became convinced the American magician possessed supernatural powers – but the whole issue of the other world which was being debated by the public at large. "Although it is not often considered as such, the novel is a great collection of ideas," adds Dr O'Gorman. "Spiritualism is certainly one of its underground themes and it was of such passionate importance to Conan Doyle. 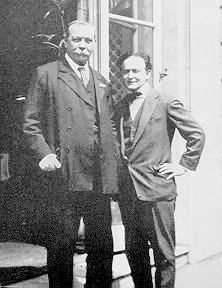 His involvement in spiritualism became such that he wrote a novel on the subject, The Land of Mist, and The Coming of the Fairies in which he championed the validity of the world-famous Cottingley fairy photographs – one of the reasons why his short stories were banned in 1920s Russia for alleged occultism. We may regard it as strange today, but he was seriously and thoughtfully immersed in its possibilities." Francis O'Gorman has written widely on the Victorian period and is best known as an international authority on the work of John Ruskin, the Victorian art and social critic. His annotated version of The Hound of the Baskervilles, published by Broadview, priced £5.99, is available through the Yorkshire Post Bookshop on 0800 0153232 or online at www.yorkshirepostbookshop.co.uk. Is Death Defying Acts on hold? 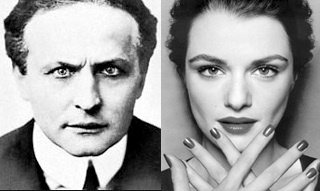 The lovely and talented Rachel Weisz (who may or may not be related to Houdini) was on Charlie Rose last night where she announced she was pregnant. She also mentioned her next movie project, and it wasn’t the Houdini film DEATH DEFYING ACTS. This film -- which tells a fictional story of Houdini's passionate relationship with a woman he encounters in Scotland in 1926 -- was announced last year in Variety and said to start production in early ’06. Yet the official IMDb page still shows only one cast member, Guy Pearce, and seven producers! Not an encouraging sign. Is Death Defying Acts going the way of so many promising Houdini movie projects? If anyone has an update, email me by clicking below. An original Houdini King of Cards poster has sold on eBay for $14,000. The online auction closed on Feb 18 and received 10 bids. King of Cards is one of Houdini’s very first posters, maybe even THE first. It’s also one of the most widely reproduced. One notable difference between an original King of Cards and the many reproductions is the large empty white space at the top of the poster (as shown in the image right). This is the area Houdini would print when and where he was appearing. Most reproductions crop the poster to the image, although Houdini’s Magic Shop (the seller of the eBay original) offers reproductions with the header intact. Houdini and The Wright Brothers team up to defeat Dr. Fu Manchu? That's the premise of Chinese Take-Out, a pretty funny second installment of the web series The Wright Stuff. Ford Austin, who plays Wilbur Wright, also plays the boxed Houdini. The short is directed by Ford Austin and Scott Ingalls. 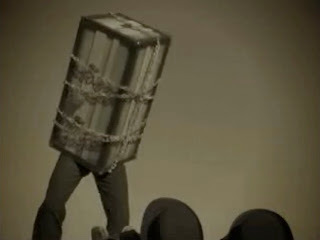 Check out this clever take on our favorite escapist at www.channel101.com. UPDATE: It appears the short is no longer available online. Are these the hands of Harry Houdini? According to a current eBay auction, they are -- sort of. These wax replicas are said to be from the Harry Houdini Magic Display which was the centerpiece display of The Classic Wax Museum which operated in Edmonton Alberta Canada during the 1950s and 1960s. 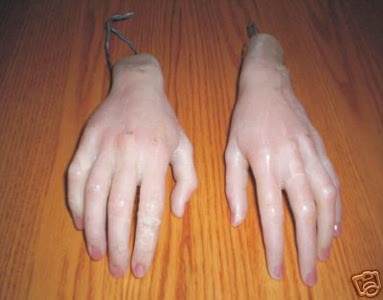 The auction claims the wax hands were made to exacting specification from photographs of Houdini’s “manicured” hands by the famed wax masters of Madame Tussaud’s Wax Museum in the '50s and brought to the museum by the late Larry Lawson, who was the owner, curator and operator of the Classic Wax Museum. 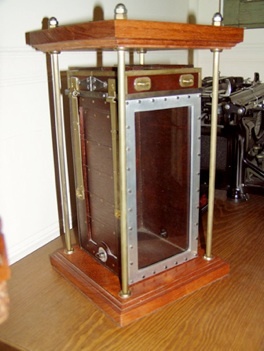 Houdini expert (and friend and neighbor) Patrick Culliton has sold Houdini's very first Metamorphosis trunk on eBay. This important magic artifact was hand built by Houdini in the 1890s. Harry and Bessie used this truck during their struggling days. 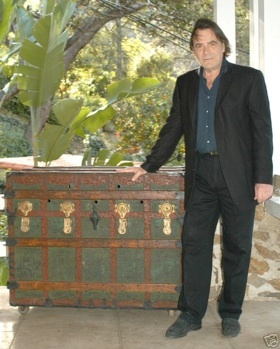 The trunk was later used by Houdini's brother, Hardeen. Partick has owned the truck for 45 years. Opening bid was $14,500, but a buyer snapped it up for the "buy it now" price of $44,500. Let's hope it's going to a good home. After many years of searching, your humble webmaster has finally added to his collection the remarkable scale replica of Houdini's famous Chinese Water Torture Cell. These beautiful replicas where produced in a very limited number by Douglas~Wayne Illusioneering in the mid 1990s. These were authorized by then cell owner Sidney Radner. The replica measures 9 1/2" tall x 5 x 4 1/2 and is accurate in almost all details. Unfortunately, I don't have the original paperwork that came with it, but a plaque shows it to be #017. This is something I will treasure.